So what do you do when you can’t find a venue you’d like to get married in? …Ever thought about perhaps getting married at your local Yacht Club? Mel and Gordy did and they got something a bit different with heaps and heaps of nautical character. All of the ship shape detail has been captured perfectly by This Modern Love. I’m petite so after hunting the bridal boutiques I decided to have my dress made, to be sure that I wouldn’t end up swamped in ruffles and lace. From the start I knew I wanted the dress to be pretty, light as a feather, have floaty cap sleeves and let me dance. When it was finished my mum and I felt something was missing so we went to Jenny Lindop in Bangor, where we had already found our stunning Bridesmaids’ dresses. She altered the neckline and added the stunning satin and diamante belt embellishment. I wore a couple of very special pieces of jewellery that day. My mum lent me her beautiful diamond pendant necklace from Lunns and she bought me a gorgeous embellished hair-band with little diamantes set in a pattern of shamrocks. All that I wanted to add to this was a friendship bracelet made by my friend Alana (from the twine we used to bind the orders of service) around my ankle… so cute. My shoes were stunning, sparkly and deliciously high. The were from Dune. We wanted our wedding to be brimming with soft colours so my shoes were a blush coloured metallic heels with a beautiful design of diamante winding up to the ankle. The best thing, they let me dance all night! The whole feel of our day was to be relaxed and comfortable so when it came to hair and makeup, in my mind, we had to look like ourselves. None of us ever wear our hair up so this meant no elaborate chignons full of pins, only small diamante combs swept the girls’ hair to the side. Lynsay of Purely Hair came to the house and looked after the girls and my Mum, while I did my own with as much care and oomph as I could, then she helped finish it so it would last the day. Our makeup was by Andrea Laverty, each of us has our own preferences for colour and style, and we don’t like to look obviously made up, so we gave her a real challenge but she was fantastic, we each felt great and it stayed all day. Each of us walked up the aisle looking like the best versions of ourselves and even with all the dancing that lasted. Our flowers were light, summery, pretty and tied beautifully with soft blue ribbon. By Vicki Gaston and Nora Mitchell at Nora Mitchell Flowers in Belfast (02890 654290). They realised that I had a fairly decent knowledge of flowers and encouraged me. They also understood exactly what I was looking for, even when I barely could myself and gently steered me when they knew a change was needed. My Bouquet: Light blue delphiniums, cream peonies, blush roses, yellow freesia, genista and eucalyptus. Bridesmaids: Delphiniums, cream and blush roses, yellow freesia, genista, eucalyptus and rununculus. Mum’s Corsages: Soft cream and yellow freesias and delphinium. 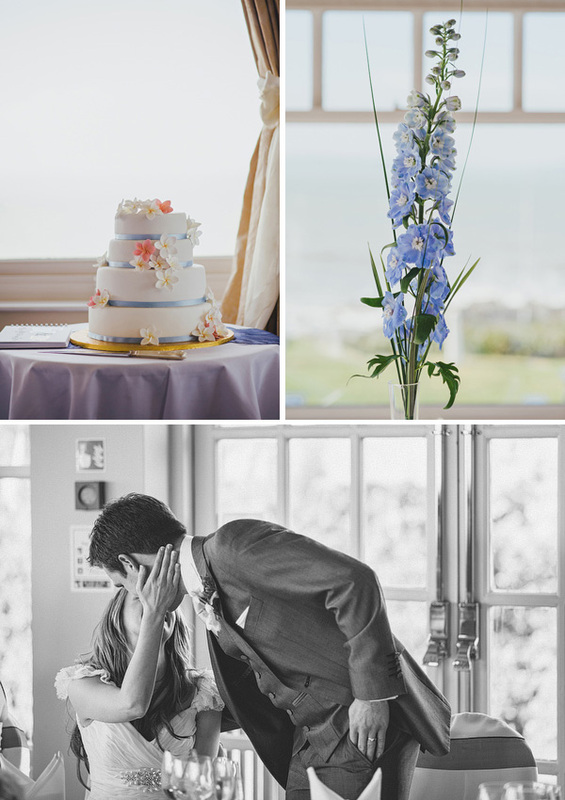 Button Holes: The men had a single delphinium bloom and cream freesia. Gordy’s had a Lambs Ear leaf (which we’d asked for specifically because they’re so soft to touch). Delphinium & hydrangea for top table. Delphinium in tall vases for each table centre. Our bridesmaids wore luminescent taffeta gowns by Watters Wtoo in Brook Blue from Jenny Lindop, Bridal Wear, Bangor. 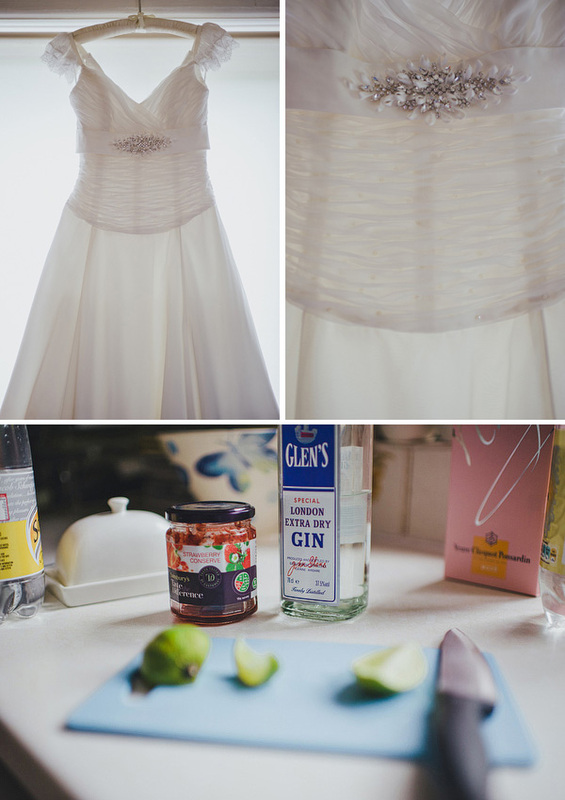 Susan and Jo looked gorgeous in them, the structured shape, the neckline and layered pleats reflected my own dress and the blue shade flattered both their eye colours and the soft summer shades we had chosen for the whole wedding. The groomsmen and Dads wore grey three piece suits hired from Red, Carrickfergus and pale blue ties to match the bridesmaids, they all looked like Cary Grant. 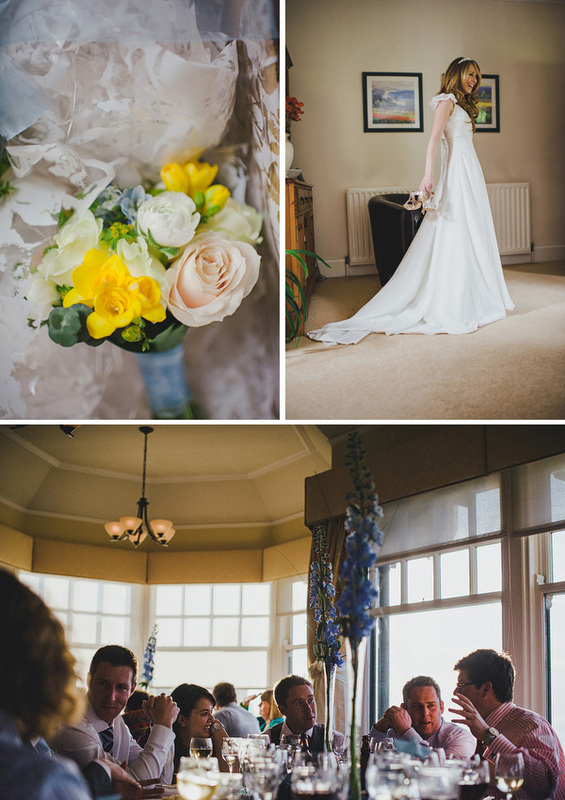 Our whole colour palette was to be fresh and sunny, mainly soft blues with other pale colours mixed through and a vibrant yellow as a highlight – I’m so happy it all pulled together! Gordy wore the tailored grey suit like the other boys but with a golden yellow tie to set him apart. It was wonderful the day we went to Red to choose it, the cut was so good and I’d never seen him in a three piece suit before, he looked so dapper, I loved it! He was incredibly handsome on the day and add to that the fact that he was grinning from ear to ear when I first saw him in the church, I was smitten. We discovered This Modern Love at a wedding fair. Their work was exactly the style we were looking for, so refreshing and light. 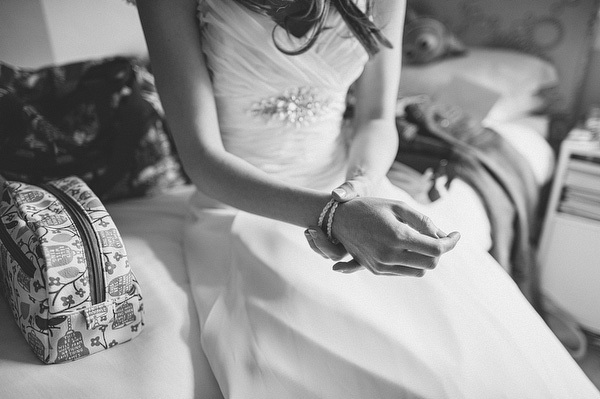 We didn’t want a traditional look, our whole wedding was to be laid back and personal, and that’s what Tim captured. Our photographs remind us of all the fun and atmosphere of the day as well as all the people we love having a great time with us. I designed the cake, it was pretty indulgent in a way. Gordy proposed while we were on a trip of a lifetime to Hawaii, and knowing that a Hawaiian theme could be too corny we went for just little touches instead. We covered our cake in plenty of Plumeria flowers (they grow all over the Hawaiian islands), my Mum and I hand made them and painted them in soft delicate colours. Gordy’s mum, Cynthia, baked the most extraordinary four tier fruit cake from his late Grandfather’s family recipe and our friend Emma iced and assembled it. For guests who didn’t like fruit cake, Cynthia made fabulous cup cakes, Lemon Curd, Chocolate and Vanilla. We wanted the music to help create the relaxing atmosphere at the wedding, Gordy found Paul Beattie our guitarist, he played everything we asked for and read our music taste perfectly (A wide range including The Beatles, Newton Faulkner, Bob Marley, etc). For the evening entertainment we booked My Wedding DJ, Alan Woods, because we were really impressed with him at our friends’ wedding in the autumn of the previous year. Our dance floor was filled all night! Al Green – Let’s Stay Together, my favourite song, it’s funny but the first time we listened to it together we both silently thought the same thing – this would be our perfect first dance song. We decided not to have favours, but we made everyone their own origami boat as a place name and keep sake if they wanted it. The yacht club was a striking venue, all we needed to do was soften things a little and add our own personality. Mandalay Weddings looked after the big details, our chair covers with navy organza and white satin sashes, the top table’s skirt, Tori also swathed the banisters in organza, decorated the bar area’s pillars and added atmosphere with up-lighters. We had a fantastic time in the months running up to the wedding finding the playful little details, lots of different lanterns with yellow striped candles from Ikea, plenty of tea-lights, yellow striped paper straws from Pearl and Earl to pop into our Mojitios. We found amazing deck chairs at BQ that everyone enjoyed in the sunshine and on through to the evening when they wrapped up warm in the blankets we provided. Whatever your style or theme it’s more important to know how you want your day to feel. From the moment we got engaged we knew instinctively that no matter what else the day was, we wanted everyone (including ourselves) to feel relaxed, comfortable and happy… and it worked! Your guests will make your day, they appreciate all your effort, they want to enjoy the day with you and they’re the one’s you’ll share the memories with in the future so involve them from the start. We had an engagement party, we kept our wedding to just 85 guests, all of whom we have a real connection with and wanted there, we let them in on the feel of our day before it even started with the stationary and asked for help with different parts of the organisation. With everyone knowing what to look forward to, they all came looking to enjoy the day, throw themselves into it and add to the great atmosphere. Choose the right venue, we visited a number of locations and many fitted into the categories of too formal, too far away, or too expensive. The Royal Ulster Yacht Club offered it’s own unique character where we knew everyone could relax inside, and out while enjoying the wonderful views across Belfast Lough. When it’s possible, make, do or be as involved as you can in the elements yourselves, it really adds to the personal feel. I’m a graphic designer so I designed all of our stationery, the save the dates, the invitations and the order of service but also between our family and friends we made our table plan (from retro postcards we brought back from Hawaii), our amazing cake, the little origami boats, we requested our favourite drinks on arrival and our menu even included our own recipe for Key Lime Pie, all these pieces add together to make the day feel so much a part your personality as a couple.